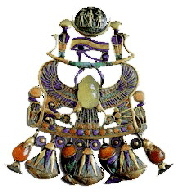 In July 2006 a television documentary reported that the central scarab in one of the necklaces found in Tutankhamen’s tomb, was actually made of Libyan Desert Glass; an ancient extraterrestrial substance which pre-dates the earliest Egyptian civilization, and not Chalcedony, as previously thought. This most unusual substance is by no means a new scientific discovery; having been known of since the early 1930s, but what has puzzled scientists is how it came to be in this remote and inhospitable area called the Great Sand Sea of Egypt. This barren frontier between the Libyan and Egyptian borders is a vast desert area with not a single water source for 150,000 square miles. Even at the outset of the earliest Ancient Egyptian civilizations, the area where this vast glass field lay had become inaccessible to all but the most hardy and intrepid of nomads and traders. Its inaccessibility made this superb stone highly prized, and the reserve of the Pharaohs. Today the Great Sand Sea of Egypt is still one of the harshest environments on the planet and this, together with Egyptian permit restrictions to travel to this area to extract samples, make it now incredibly difficult to source pieces, and supplies of genuine stones have reduced to a trickle. 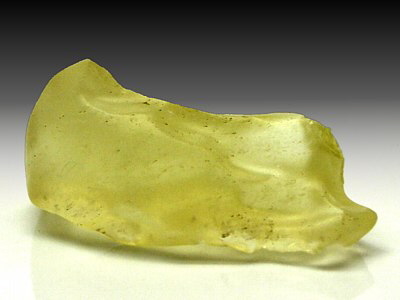 Libyan Desert Glass is an extremely pure form of silica, some pieces having a high iridium content; a typical meteoric material, and like Moldavite, is a tektite. Tektites are primarily glass content objects, formed by a large meteor strike on the Earth’s surface. Unlike Moldavite, however, Libyan Desert Glass has been estimated at 28 million years old, in excess of 10 million years older then Moldavite. Most tektites, with the exception of Moldavite, are black, but these beautiful specimens have a gorgeous straw yellow to pale apple green colour. They also often contain small dark speckles, which are remnants of meteor dust. Due to the many millions of years spent being gently polished by the shifting desert sands, they have a very soft, matte appearance. Metaphysically they share some of the same properties as Moldavite. They are believed to be of particular benefit to sensitive people, especially 'star children' who may sometimes find it difficult being back here on the Earth plane with its heavy energies, principally those energies caused by the pain and suffering currently being experienced in the world today. They may also help these individuals reconnect to the otherworldly places that were once their homes; to reunite them with their Star Families and other Star Seeds, whilst also grounding them in the Earth plane so that they may get on with the task at hand during this incarnation. They also resonate with, and transmit the Golden Ray; which is the highest light vibration the physical body can receive. Spiritually the planet is undergoing a huge awakening and energetic transformation. We are rediscovering and reconnecting with the Ancients and the knowledge held sacred to them, and as this process gathers pace, we are being given more and more powerful crystals to work with. As our light quotient increases in our energetic body, we have been given access to beautiful Ascension crystals to aid us on this journey, like Phenacite, Azeztulite, Moldavite, Atlantean Record Keepers and Lemurian Seed Crystals to name a few. Libyan Dessert Glass is another of these wonderful, magical stones. It is a stone of Expansion, Compassion, Universal Love and Enlightenment; carrying with it the energy of the cosmos. The carved piece found in Tutankhamen’s breast plate/necklace was designed to be worn directly over the heart, and it is believed that by placing a piece over this area you will be able to activate the higher heart chakra, channeling cosmic energy directly to it. This energy will play a major part in our spiritual transformation and consciousness shift in the coming years, and while much is still to be discovered about this most unusual stone, and we are delighted to have found a genuine supplier so that we may offer a few pieces for sale. Sadly, due to their high glass content, these lovely stones are very easy to fake. ‘Caveat emptor’ (buyer beware) is the best advice when sourcing these enigmatic extraterrestrial ‘gems’. 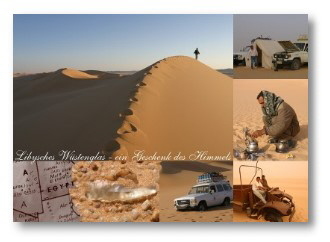 All of our Libyan Desert Glass specimens are from an official expedition in 2004, and each piece comes with an individual Certificate of Authenticity, signed by the expedition leader and they also carry an official stamp. The certificates include photos from the expedition plus a short description and a small black and white photo of the individual piece, together with sizes and weight. Above: Certificate of Authenticity outer cover.